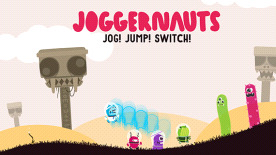 Joggernauts is a cooperative auto-runner party game for 2-4 players where you try not to kill your friends. Take turns (probably failing) to lead your team through deceptively difficult color-coded platforming levels. Help the alien athletics team find all of their missing trophies. Yell colors at your friends.